Following on from Southend Cycle Town I thought I'd provide an update. They're already building it! Speaking to the construction workers the completion of the cycle path has to be completed by the end of March in readiness for an event. So we're seeing the plans on 29th March, for comment, and the scheme deadline is two days later on the 31st!!!!! They have constructed a 2.5m wide cycle path where the parking used to be. "The Western Esplanade works will be a Hybrid Cycle Lane. You can see example of these going in around the country. 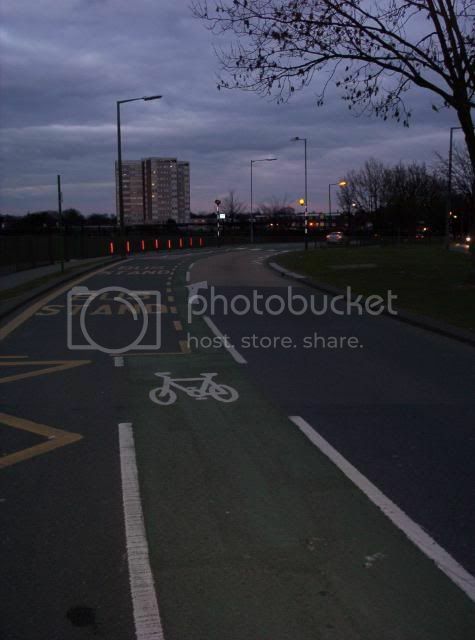 A Hybrid Cycle Lane is one where the footway, cycleway and carriageway are all separated and a different levels (see link for a picture of one Cambridge Cycling Campaign » Newsletter 74 (October/November 2007) ). It will be a two way cycle lane"
Now those linked photos are fine, but they all show a wide cycle path far away from the road carriageway. This new path is just 2.5m wide and there is no seperation from the traffic. 8.5.1 The minimum widths given in this section relate to what is physically required for the convenient passage of a small number of users. They do not take into account the need for increased width to accommodate larger user flows. Wherever it is possible, widths larger than the minimum should be used. Practitioners should not regard minimum widths as design targets. 8.2.2 A design speed of 20 mph is preferred for offroad routes intended predominantly for utility cycling**. This provides a margin of safety for most cyclists. The average speed of cyclists on a level surface is around 12 mph. 8.1.2 In general, offroad cycle routes in urban areas tend to be the least desired option, and it is usually better to cater for urban cyclists onroad if this is practicable. At just 2.5m wide instead of 3.2m wide, do you think this is a bit narrow? - All design documents refer to cyclists as 1metre wide, requiring additional 0.5m "wobble space". This is why two way paths are recommended as 3m wide. - As it's a two way cycle route eastbound cyclists will need to thread the needle between oncoming cyclists and 30mph oncoming motor traffic. - Cycle tracks are to encourage novice cyclists, and family leisure cyclists. Would you be happy bringing your family down here where there's a risk that your children might meander into the path of oncoming traffic? I'm not. - In France, British motorists have to fit adapters to prevent their headlights blinding oncoming traffic to their left. Motorists won't fit these adapters just to drive along the Southend Seafront, so therefore cyclists are going to be dazzled at night and therefore going to find it even harder to spot the gap between traffic and oncoming cyclists. 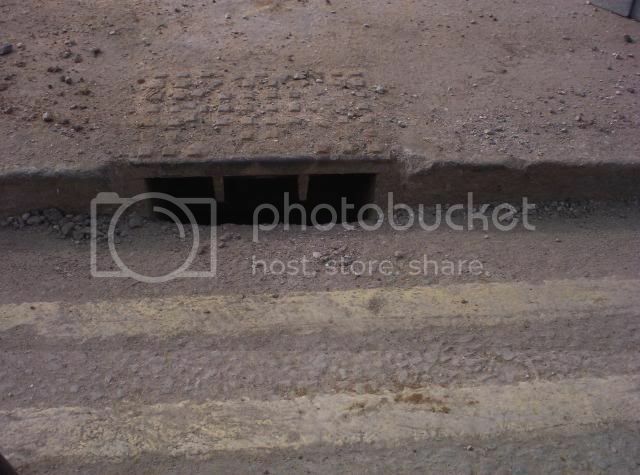 The camera broke when I dropped it, but these drains are still in use, but the bottom half is now obstructed by the tarmac surface of the cycle lane! In strong winds sand blows across the existing carriageway only to be swept away by car tyres. What will happen in the future? I expect the cycle track to get covered in sand* and also flooded whenever it rains; the carriageway will also flood in the rain and the cyclists will get drenched by passing motorists. I really think that creating a two way cycle track at just 2.5m wide and not segregated from the traffic is a nightmare here. I am sh:tting myself. Wowbagger posted a photo of Prittlewell Chase some time ago. They've finished painting the lanes now. I've been reassured that this is "a 0.5m door zone with a 1.5m cycle lane". I give up. I really do. * I used a sand covered seafront cycle track in France once. The sand caused other cyclists to lose traction and fall off. ** The seafront route is well used by cycle commuters. I hope they're having a Grand Opening Ceremony. We can all show up and cycle along the road. I'd prefer it if we can arrange for their opening ceremony to be heading east. We could arrange a forum ride to be heading west at the same time. It'd be a real shame if the councillors had to take avoiding action into the path of oncoming traffic wouldn't it? What the hell can we do? Why the hell are we not allowed to see the plans until the 29th March? I've been specifically asking for them but told I can't see them. What I find hard to understand is that Southend is supposed to be a Cycle Town but there exists a great deal of animosity between the Council and the resident Cyclists? The Council also has problems with other planning developments. Perhaps somebody should attempt to cure the problem and to stop fighting. I am sure this could improve your circumstances. Also it seems from my reading here that Southend is the only Council in the UK that has these issues? That's awful Nutty! Good work on exposing their negligent designs. Start a "Crap Cycling in Southend" blog. Cycle lanes carefully painted in the door zone irritate the hell out of me, Waltham Forest have got loads of them. Because I don't want to lose a testicle or smash my hand I ride a door's width away....and get bibbed. The council are steering cyclists straight into danger. That does look like one crappy cycle lane. Having cyclists ride between oncoming cycles on one side and oncoming cars on the other is crazy. You call it "threading the needle" but a more appropriate analogy might be "cyclist sandwich". And the door zone thing, it looks from the photo as if any opening car door will take the whole cycle lane, not just the 0.5m (or 43cm - I suppose they're counting the width of the white line as part of the zone?) alloted. "Warning, this cycle lane places you in harm's way". And the door zone thing, it looks from the photo as if any opening car door will take the whole cycle lane, not just the 0.5m (or 43cm - I suppose they're counting the width of the white line as part of the zone?) alloted. I use the Prittlewell Chase lanes most days, quite happy to do so. I cant see who will use the path being constructed along the seafront though, unless you are travelling to the West. Anyone going East would be using the road imo. Using the path in a East direction what happens at Peter Pans? I used the road along the seafront a few weeks ago, the amount of abuse I got from passing motorists was quite frankly shocking. I cant recall anything similar in over 30 years of cycling in this area. Part of the driving public in Southend is becoming very hostile to cyclists from what I am seeing. Nutty, that is an excellant point about the car headlights. Could you ask for a 'risk assesment' to be done? Part of the driving public in Southend is becoming very hostile to cyclists from what I am seeing. Good points in my mind. 1) It used to be a bit funny cycling there as you weren't really in one lane (because of parked cars) or the outside lane (because there was plenty of room between the parked cars and passing traffic). Now there are distinct areas for motorists and cyclists. 2) This is a school area, so provision is being provided for novice cyclists. Bad points in my mind. 1) Now that cyclists and motorists aren't sharing the same road space and there is a distinct place for cyclists, I think that motor traffic speed has increased. This is worst amongst the buses and the road carriageway left is exactly a bus width wide... they almost intrude into the cycle lane. 2) The lane is narrower than I've been told they planned it (and less than the 1.5m recommended minimum), and the "door zone" really is taking the mick. Whilst it's good that "something was done" I think that the lane is encouraging cyclists to be closer to the parked cars than they should be, and for the overtaking traffic speed to have increased and be putting the cyclist at more risk. The worst scenario I've had along there was when the bus was in the bus stop. I couldn't get out into the 30mph rush hour traffic, and didn't fit down the 43cm bit photographed above. Therefore, for the first time ever, I had to park the bicycle behind the bus until it left. Before the lane for cyclists was painted I never had to stop cycling. Having said all that, I'm not going to be campaigning much against that lane or for remedial works to be completed. There are much more dangerous schemes they're creating and that we need to tackle. 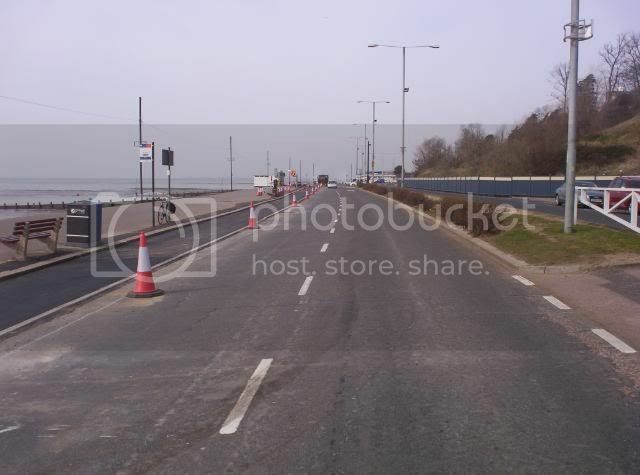 I think that the reason that the motorists in Southend are becoming anti-cyclist is that they are seeing the speed cushions going in everywhere, they're seeing money being thrown at cyclists for schemes such as the seafront, and they're seeing more and more congestion being caused by these works. Now that Southend is a Cycle Town motorists are blaming us for the worsening road conditions. Just look at lots of the letters appearing in the local papers. Clearly, Southend gets a lot of publicity in these pages because there are three or four regular contributors who know the Council of old. Believe me, they haven't changed in the 50 years or so since the late Paul Foot referred to them from his Private Eye column as "My favourite Council" because they gave him so much material to work with. You can't work with a Council that deliberately targets for harrassment those of its citizens it doesn't like, even if the said citizens haven't campaigned against Council policy for 6 years or so. My pal the Head Teacher and one if his senior staff always refer to the Southend Council as "The Good Ole Boys". Yes, sorry about that. Kathy was reading the forum and I asked about this thread, and then wanted to reply with the details around the widths of the lanes. Still, after 5 minutes of effort I did proudly manage my second post from an iPhone. Normal service will now be resumed...... blommin apple etc etc etc. I have lost count of the number of times over the last ten years that I have attempted this. I have offered my time, freely and at their convenience, to review the road scheme designs at development time so that cycling issues can be ironed out before they are constructed and waste public money. This offer has never been taken up and instead I spend most of my time writing to the Council complaining about what they have constructed. When they asked for my help on the Cycle Town Scheme (they only come to us if they want to prove they are "consulting with the relevant parties" I reluctantly agreed, because I want to move forwards, and I thanked them that they were creating the cycle group with the purpose as posted and linked above. Instead they have ignored us and bludgeoned their own way forwards without any actual consultation. Just look at the fact they have a construction deadline just 2 days after they will let us see the plans for the first time! I have held individual meetings with them, outside of the cycle forum, where I have requested these plans so that I can review them at my leisure and so waste the least time in the cycle group meeting. They have refused to let me have any prior view, so in our meeting we will have one short agenda item in which we will have first sight of the plans, then decide how to respond. A very inefficient use of time and resource? But it will obviously take more than one person to change Southend Council into a responsible organization. Or is there any other way to replace them? National and local Newspaper reports? TV Reporting? Legal methods? as in failure of the Council and it's Staff to carry out their duties in accordance with the Law or in a Professional manner? 1000's of letters of complaint sent to your local MP's? and so on. Best of luck but you do need a substantial group approach not scattered supporters. Another bad point (Prittlewell Chase) heading towards the town, just after the school gates where the road turns to the right. If you ride towards the outside of the lane, as I do, when a bus comes from behind they are unable to pass due to the overhang at the front of the bus. This has been no problem so far, I would like to think the reason for that is the bus companies have been made aware of this and drivers told to take extra care and drive with caution in that area. They should be anyway, as in any civil society, given the road is adjacent to a school. I had a ride along the seafront this morning to look at the new facility. There is going to be an accident here without doubt. I can also see drivers parking cars on the lane as there doesnt seem as though there will be anything in place to stop them. I had an e-mail from the hospital travel plan coordinator last week, on Monday there is going to be someone from the council to tell us about cycling in Southend, cycle training etc. If I get time I will try and talk to them, but it all depends how busy things are. Nutty if you are about, or anyone else its from 0930 untill 1130, boardroom at the old entrance, afaik its not just for hospital employees, anyway the hospital belongs to us all. That sounds like one of their back slapping bigging the project up type publicity events. I'll be at work but I doubt that it's the right place for me to come to to ask specific questions around designs. If you do go, please can you ask the simple question of "what plans are being put in place to cater for the increased accident rate amongst cyclists?" I'm still trying to get hold of plans in advance, but please can I suggest all local cyclists attend next Monday's cycle group? 29th March 2010 19:00-21:30 Committee Room 6 at the Civic Centre. This is a meeting for you, and that you are invited to. The Cycling Group is open to organisations, groups and individuals that wish to become involved in the Cycling Southend Programme to promote Southend as a Cycling Town. The Group will appoint two representatives to the Cycling Southend Stakeholder Group to represent the views of the cycle user particularly in matters of design and cycling promotion. Working with the Council`s “Bike Squad” to promote cycling to employers, schools, public etc. I have just e-mailed the following to Cycling Southend. I am sure it will do no good other than to warn them that the World is watching their antics. I didn't wish to be specific about their plans which would have weakened the impact of what I was requesting to one element only. "Yes, As a lifelong cyclist I am pleased that you classify Southend as a Cycling City. But I am very unhappy with the Council's attitude towards it's resident cyclists. I read of reports where you totally ignore their sincere attempts to help with your decisions. 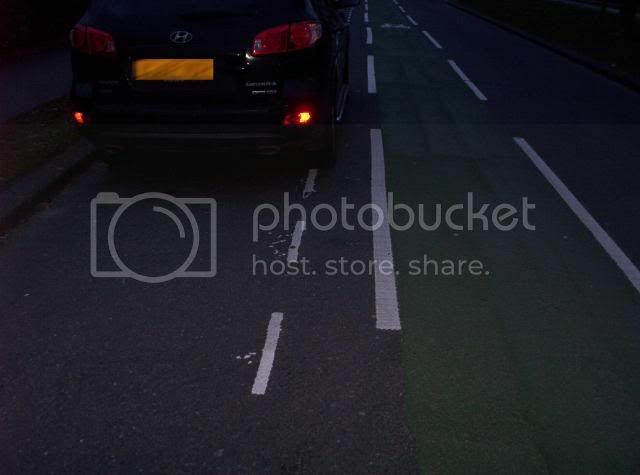 All I can see from photographs taken of your cycle lanes and other road markings are some rather poor and inexperienced decisions. Decisions which were never taken by people with "real" cycling experience. That's the bit that drives me insane. Our local major cycle path (A34 dual carriageway) is nearly finished and looks great, but the sticky-up diagonal kerbs, the sign post in the path and the bus stop overhang at cycling head height would be unthinkable on a "real" road. We get fobbed of with a bit of spare space and are supposed to be grateful!